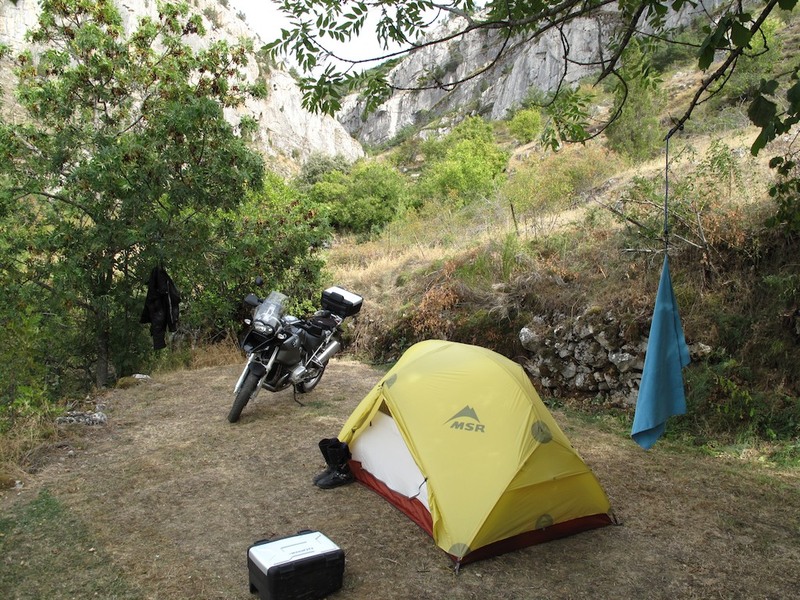 Having decided to spend another day at Mirantes, I left the campsite at 11:00 to find fuel at Magdalena and enjoy a day of riding without luggage. But first some breakfast, and I find a small bar on the edge of town. The scene is typical of a traveller’s dread as I enter the dimly lit bar from a street of bright sunshine; the large bartender with pot-marked features stops polishing glasses and looks me up and down, as do the dozen or so local workers at the bar. Lo siento, no hable Esponol, and the spell is broken. The bartender’s daughter appears, and he nudges her to try and get her to practice the English she must no doubt have learnt in school. I order whatever he wants to bring me for desayonu, and get coffee and a large pretzel-shaped piece of bread with knife and fork. The bread is semi-sweet and very filling, the coffee excellent. Sitting down at a table near the window in order to keep an eye on the bike, I overhear the daughter testing her father and some of the locals on English words. She’s pretty good, and soon starts playing English pop songs on her mobile to see if she can provoke a reaction. Breakfast is 1.30 Euros, the boost to my confidence priceless. I leave west on the LE460, and after riding past several fun looking dirt tracks leading off the road I decide to try one. It’s not too hard, mostly gravel and dirt that has at some point in the past been used by 4×4 vehicles. I tick along in second gear, weary of my laptop and a bottle of water bouncing around merrily in the top-box. The track climbs near the top of a small mountain, with a steep, goat-sized footpath completing the ascent to a summit of lavender and bee hives. The GS copes easily, and I’m treated to a pretty view of a nearby town before riding back down to the easier track. This time I remember to turn off the ABS. I’m not sure where I am, only that the LE460 is still visible on the GPS albeit a couple of km away. Whenever there’s a crossing I take the path that looks like it’s been used most recently, and before long emerge in an abandoned quarry at the foot of a valley. Just then the tracks narrows by virtue of a section that’s been washed away, and I’m forced to decide between riding the narrow looking remainder or turning around. I leave the heroics for another day and head back for the road, suddenly passing lots of cota privado signs pointing whence I have come. I notice that many of the surrounding hills in this region have a wide, straight path going directly to the summit – clearly somebody with a bulldozer and time on his hands likes a challenge. Perhaps they’re building more wind farms here soon? Wild camping would be easy. 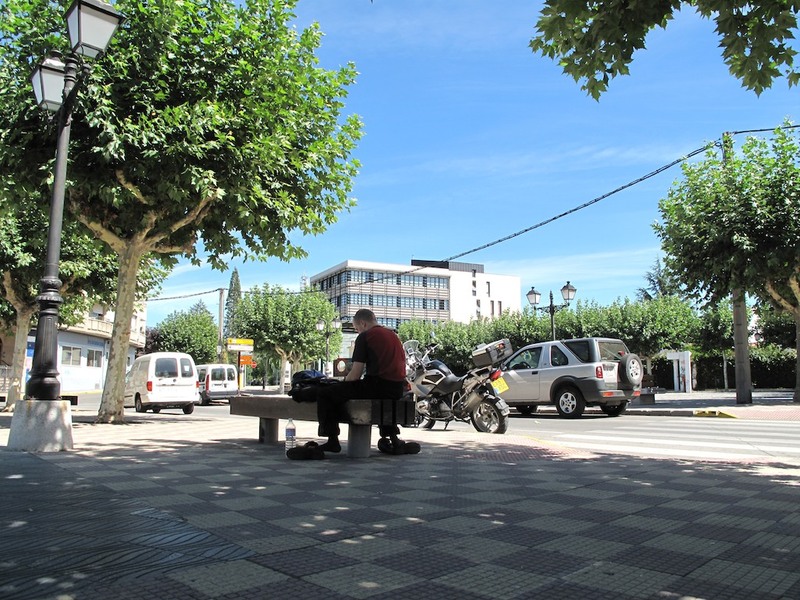 I take the road south-east to Benbibre and stop in the town square to enjoy half an hour on a shady bench without jacket and boots. Seeing me reading Michelin map #572 (my only one, which I have just exited at the bottom) a family approach and write down vague directions back to Santander in the back of my notebook. Leon, Burgos, Santander. Autopista. I want to explain that I have all week and am in no hurry, but they’re Being Helpful. I choose to ignore the directions and head north to on CL631 instead, arriving at Villablino and recognizing it as the town I’d crossed some days previous on the way to Somiedo. On the way out I am skillfully spat on by a third floor balcony dweller, and, not having the luxury of waving with both hands I spare him a single finger instead. Good shot though! The road is OK but busy, dust (Slate? Coal?) 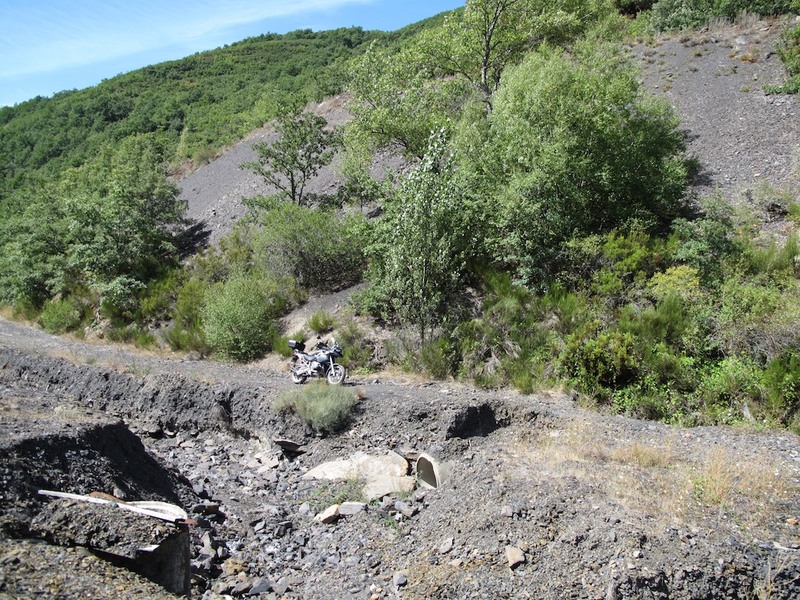 from the many lorries that service adjacent quarries turns the carriageway black and in all probability slippery. 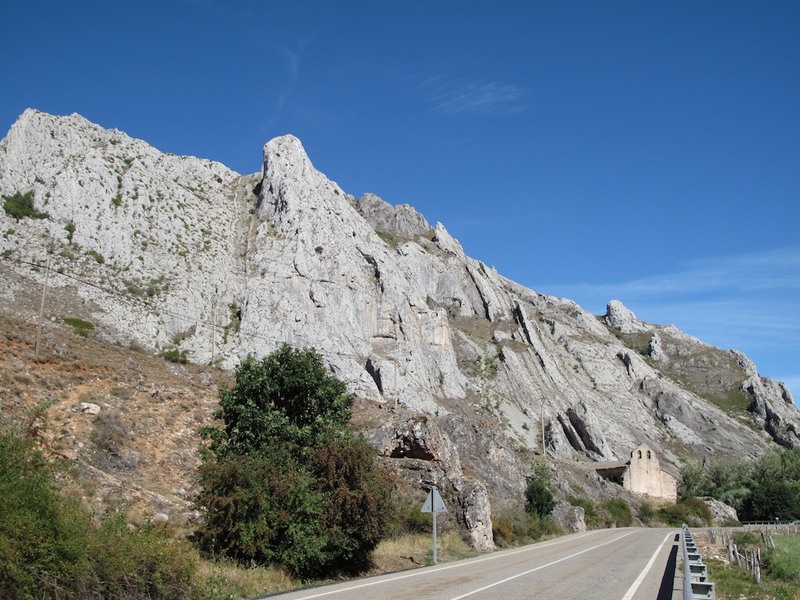 Travelling east again, I take the CL626 as before but do not turn off to Somiedo, instead carrying on to Cabrillanes. Signs on bridges advertise the river Luna, and I am a little disappointed to learn that the region is named after a body of water rather than the surface of the moon which it loosely resembles. The landscape is a geologist’s dream; low tundra and immense fields of horses and cattle rub shoulders with jagged peaks topped with an aquamarine sky. I pass an old church, surely derelict if the lack of roof is anything to go by, though one bell remains, as does the cord. I stop for more photos at Barrios de Luna, then head back to campsite where Papa is untangling rabbits. I like Papa, he has a bright manner and is always asking how I am (I think) but also prone to long periods of just staring into the middle distance, no clue to betray the nature of his thoughts. Sometimes he stands at a window, looking out over the hills, but mostly he watches the small colour TV fixed high in a corner of the bar. A looping newsreel of about 40 minutes documents street prostitution in Madrid, the national problem with junk food and obesity, the launching of La Vida Loca – a film about gang warfare in South America, more violence in Palestine. I know he’s not really watching so much as just letting it all wash over him because the program is on its second identical loop, his expression the same as before. I want to reach out to Papa, to share his thoughts. I want to ask where Mama is – until now it’s just been him and the three sisters plus boyfriend / brother, but am prevented through lack of language. Maybe that’s for the best. Dinner is served at 22:30, first the same soup as yesterday, then a plate of lamb and chips. I answer Helena’s enquiry for beverage of choice with vino tinto, and she brings me an entire bottle to add to the three large beers I’ve already consumed during my philanthropic studies. I only manage half the wine. The bill comes to 12 Euros, and on asking how much the wine will be am told it’s already included. The family eat together as before, with everybody rushing about and setting the table once Papa dismisses wailing Israeli crowds and thong-clad hookers. After the meal, the family plays cards and Helena sweeps the floor. Satisfied with the improved family scene I stagger to bed.